"Senator Kirsten Gillibrand, an outspoken advocate for women’s causes and electing more women to office, is entering the 2020 race for the White House." Senator Kirsten Gillibrand, an outspoken advocate for women’s causes and electing more women to office, is entering the 2020 race for the White House herself, becoming the latest candidate to join what is expected to be a crowded Democratic primary to take on President Trump. In an appearance Tuesday on the “Late Show With Stephen Colbert,” Ms. Gillibrand, a New York Democrat, said she was forming an exploratory committee to raise money and travel the country for her run. She is scheduled to start campaigning within days, with plans to spend the weekend in Iowa. “I’m going to run for president of the United States because as a young mom I am going to fight for other people’s kids as hard as I would fight for my own,’’ she said. Ms. Gillibrand has emerged as one of the most forceful critics of the Trump administration in the last two years. She has voted against nearly every significant nominee Mr. Trump has put forward, and rallied opposition to his congressional agenda. In the last two months, as she publicly considered a campaign, she has spoken repeatedly about the need to restore the “moral compass” of the nation. But Ms. Gillibrand, a 52-year-old former corporate lawyer, has been criticized by opponents as a politician without a firm ideological bearing of her own, having transformed from a pro-gun, conservative upstate congresswoman with deep ties to Wall Street financiers to a crusading liberal who rails against guns and refuses corporate political action committee money. Ms. Gillibrand’s 2020 announcement was widely expected after weeks of presidential buildup, in which she secured office space for a headquarters in Troy, N.Y., and expanded her political staff. Ms. Gillibrand is not the first woman or even the first female senator to announce her bid; Elizabeth Warren of Massachusetts formed an exploratory committee two weeks ago. Other senators expected to enter the race soon include Cory Booker and Kamala Harris, while Senator Bernie Sanders, former Vice President Joseph R. Biden Jr. and former Representative Beto O’Rourke are weighing candidacies. 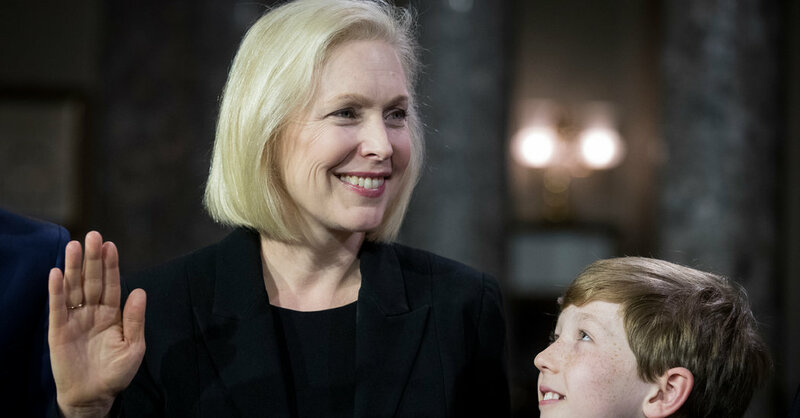 Ms. Gillibrand has registered little support in early presidential polls but she is still widely seen as a formidable candidate. Fiercely competitive and a prolific fund-raiser — she had more than $10.5 million in the bank as of late 2018 — she has invested heavily in recent years to build up a small donor network online, as well. The 2018 midterms demonstrated the appetite among Democratic voters to elevate women into power, and Ms. Gillibrand is expected to make her advocacy for women’s causes and candidacies a key part of her campaign. For years, she has raised money for female candidates through her political action committee, called Off the Sidelines, which is also the name of her memoir. That work has helped her develop a national network of female donors she is expected to tap into for 2020. She has lined with the left flank of her party on policy positions, embracing economic populism, but she is not expected to run as explicitly ideological a campaign as rivals like Ms. Warren and, if he runs, Mr. Sanders. Instead, Ms. Gillibrand, who has visited every county in New York each year of her Senate tenure, is expected to lean on her ability to connect with audiences on a personal level. Her presidential announcement comes almost a decade to the day after she was appointed to the United States Senate — in what was then a surprise pick by the former New York governor David Paterson, who elevated Ms. Gillibrand over some better-known rivals to replace Hillary Clinton when she became secretary of state. Her Senate seat has a storied lineage with recent predecessors including Mrs. Clinton, Daniel Patrick Moynihan and Robert F. Kennedy. At the time of her appointment, Ms. Gillibrand had just won re-election to her second term in the House after seizing her Albany-area seat from a Republican incumbent in 2006. She has moved steadily to the left politically since then, abandoning her former positions on guns and immigration, in particular, as she has become one of the Democratic Party’s most reliably liberal voices. In the Senate, she has taken on some big fights, including her successful push to repeal the “don’t ask, don’t tell” policy in the military and her continuing battle to remove sexual assault cases in the armed forces from the military chain of command. She has pushed to end the scourge of sexual harassment on college campuses and to strengthen protections for women working on Capitol Hill. In late 2017, she was the first senator to call for the resignation of Senator Al Franken of Minnesota as he faced multiple accusations of sexual misconduct. Her decision — which was quickly echoed by other senators, both men and women — led to a backlash from some Democratic activists and donors who were angered that Mr. Franken was forced to resign while a president accused of harassment by multiple women remained in office. Ms. Gillibrand’s stance on Mr. Franken came on the heels of saying that, in retrospect, President Bill Clinton’s sexual relationship with an intern would have been cause to resign, even though the Clintons had championed her early in her career. The back-to-back episodes cemented her reputation as a woman willing to buck powerful men in her own party. Born in Albany to a political family, Ms. Gillibrand was greatly influenced by her grandmother, Dorothea Noonan, known as Polly, a powerful figure in the political machine of the longtime mayor of Albany, Erastus Corning. Ms. Gillibrand began her career as a Manhattan lawyer in the 1990s, and has said she was inspired to get into politics by listening to Mrs. Clinton, then the first lady. She eventually ran for Congress, in 2006, in what was seen as a long-shot race against an entrenched incumbent, Representative John E. Sweeney. The district was 93 percent white, and Republicans vastly outnumbered Democrats. While some 2020 candidates are expected to make explicit their appeal in Middle America, Ms. Gillibrand, at least among the Democrats from coastal blue states, can point to her initial representation of a heavily Republican and more rural seat in the House as a sign of her experience, if not electability, with such voters. She secured re-election in 2008 in a House race that was the most expensive in the nation that year. She won in a nearly 25-point landslide. Last November, she won election to the Senate for the third time after she pledged during the campaign’s final weeks that she would serve her full six-year term. Ahead of her impending presidential candidacy, Ms. Gillibrand met last Saturday evening with a diverse group of two dozen women for a listening session at the home of the author Letty Cottin Pogrebin. It was a wide-ranging two-hour discussion, Ms. Pogrebin said, during which Ms. Gillibrand took notes. Among the pointed questions the senator was asked: How would she become known in the rest of America? Next articleI Put My Baby Daughter in Dinosaur Overalls. Am I an Anarchist?